commitment to invest in it (new technol- But the investment didn’t stop after the were installed, simulators that interact that it can simulate three ATBs running ogy) every year. We budget for it every simulation center opened, as Bouchard directly with the full bridge mission sim- simultaneously. Training and Safety is central to all that ed and improved. To that end, last month tugs, for example. In addition, the Class develop this facility,” Johansson con- we do.” a pair of Class D desktop simulators D models can be con? gured as ATBs, so cluded. U tion scenario set in the Port of New York. 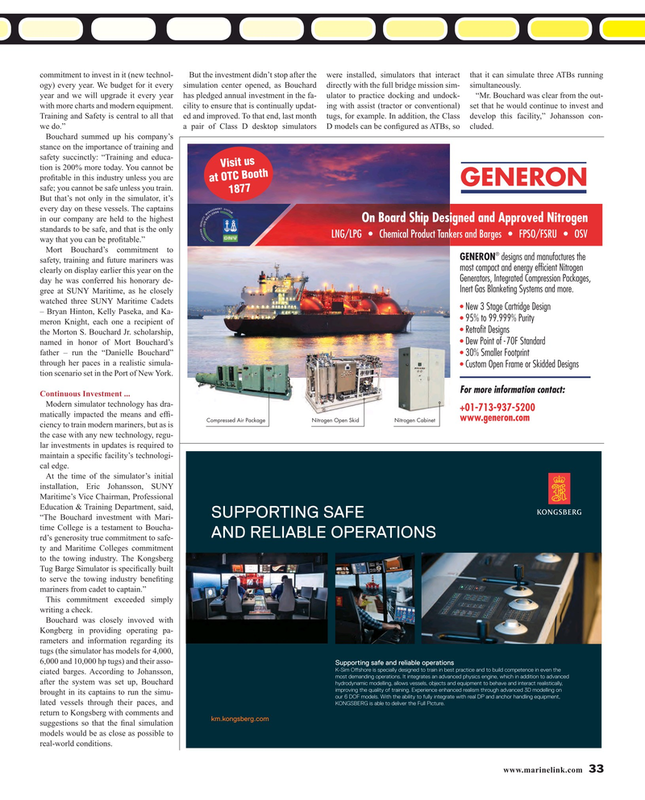 Nitrogen Open Skid Compressed Air Package Nitrogen Cabinet ciency to train modern mariners, but as is the case with any new technology, regu- lar investments in updates is required to maintain a speci? c facility’s technologi- cal edge. This commitment exceeded simply writing a check. KONGSBERG is able to deliver the Full Picture. return to Kongsberg with comments and km.kongsberg.com suggestions so that the ? nal simulation models would be as close as possible to real-world conditions.